Enveloped, spherical. Diameter from about 150 nm. The viral RNA dependent RNA polymerase binds the encapsidated genome at the leader region, then sequentially transcribes each genes by recognizing start and stop signals flanking viral genes. mRNAs are capped and polyadenylated by the L protein during synthesis. The C'/C/Y1/Y2 proteins are expressed by leaky scanning, and V/W proteins by mRNA editing. 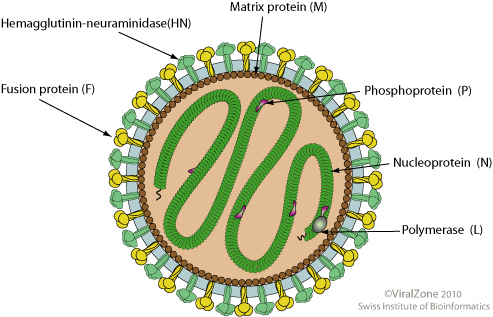 Virus attaches to host cell surface receptors through HN glycoprotein.